Tom Thumb Food Pharmacy provides chain of supermarkets in Dallas Forth worth Metroplex, with its headquarters in Roanoke, Texas. The company was found in 1948 introducing the concept of supermarkets, now the brands of the company include Safeway Kitchen, Safeway Farms, O Organics, Safeway Select, Lucerne, Pantry Essentials, Refreshe, The Snack Artist, Eating Right, Debi Lilly, Bright Green, Rancher's Reserve. 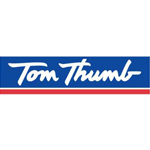 The Tom Thumb offers loyalty card which provides reward points providing discount on gasoline, also donation for charity as a part for their marketing. With the parenting company the Safeway makes up to 112 stores in Texas. There are currently 0 consumer reviews about Tom Thumb Food & Pharmacy available. Share your review. Please take a note that you are about to post a public review about Tom Thumb Food & Pharmacy corporate office on CorporateOffice.com. This review will be public, so please do not post any of your personal information on this website. If you would like to contact the corporate offices of Tom Thumb Food & Pharmacy, please use their contact information such as their phone number, website, and address listed above to contact them. However, sometimes staff from Tom Thumb Food & Pharmacy headquarters do read the reviews on this website.